The poet turns again to Grendel, though Beowulf’s beaten him. I thought that this poem was called Beowulf for a reason. But it seems that here the poet’s forgotten about that temporarily as he shifts back to Grendel’s final moments. It could be that this is simply the poet waxing on about Grendel as an extended description of his severed arm and what it means. That’s definitely a part of what’s going on here since in lines 843-844 we’re told that the arm tells the story of how Grendel was beaten by Beowulf and forced to limp back to the fens. But I can’t get past the way this extended description starts. The poet doesn’t preface it with something like “oh, wonder of wonders, the arm showed true/Grendel’s wretched final hours,” or “that arm hanging there, gruesomely suspended,/ told the final tale of Grendel/how the gore-spattered one limped home to hell.” Instead the poet says “None of those there/thought upon that one’s death sorely” (“No his lifgedal/sarlic þuhte secga ænegum” (ll.841-842)). The phrasing of this sentence is a little weird with “sore” being used as an adverb to describe “thought upon,” but I think the meaning here is that none of the people who came to see it thought, with sorrow at heart, about Grendel’s final hours as one defeated and fated to die. But why even mention the idea that no one felt bad about Grendel? Simply to contrast with the obvious emotions of joy or triumph that are coursing through the spectators’ minds and hearts? I still think that this focus on Grendel amounts to a sort of lament. Maybe it’s even foreshadowing the lament over Beowulf at the end of the poem. Or, at the least, maybe it’s a lament for a fallen monster because even as a monster, Grendel was close enough to being human. And, given his demi-human nature and the Abrahamic god’s tendency to forgive when asked, maybe Grendel could have found salvation had he been able to veer away from his wickedness. I mean, that’s what I get from where this passage ends, too. 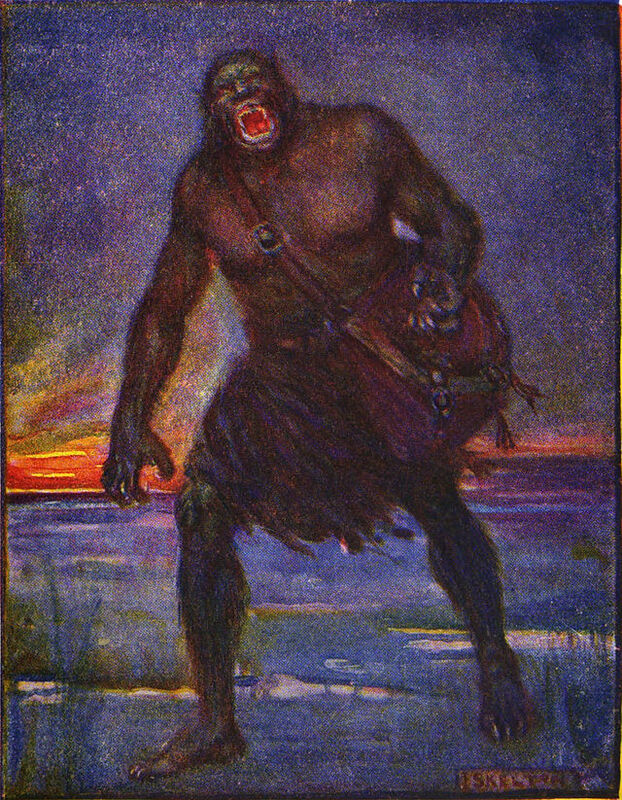 Grendel is noted as having a soul and that he went to hell. Surely, poetic license with language aside, this connection of Grendel and a soul suggests that he wasn’t supposed to just be some wild humanoid animal. It’s been noted that Grendel is a member of the Anglo-Saxon humanoid classification of monsters (I’d give the source, but it’s lost in my Twitter feed). I think the most distinct property of this monster category is that they’re practically human beings. There’s just some minor difference in the things in this category that marks them as monstrous. So, could this sort of monster also still be human enough to have a soul? Do you think that the poet’s constantly returning to Grendel’s plight and sorry end is meant to be taken as a call for pity for the beast? Or is it just the poet being poetic and aggrandizing the death of a foe that was equally aggrandized through wide-spread stories of his terror? This week’s passage is full of compound words. But, most of these compounds are just combinations of two words that literally translate into their Modern English equivalences and are left at that. These simpler compounds include words like “gif-heal” (a combination of the word “gift” or “to give” and “hall” meaning “hall in which gifts were made/given”) (l.838); “guðrinc” (a combination of the word for “war” or “strife” and a word for “man” or “hero” meaning “warrior”) (l.838); “tir-leas” (a very neatly straightforward combination of the word for “fame” or “glory” with the suffix meaning “less” tacked onto it) (l.843); “heoru-dreore” (which combines words for “sword” and “blood” to mean “sword blood/gore”) (l.849); and “fen-freoðu” (a word that combines the literal words for “fen” and “refuge” to mean “fen refuge”) (l.851). Of course, this wouldn’t be a passage of Beowulf if all the compounds were so neat and tidy. Two in particular stand out as strange and difficult. The thing is, if “folc-togan” means “chieftan” or “commander,” then all three of these interpretations of “togan” are possibly right. A leader of a people needs to be tough and tenacious, and, I guess, sticky when it comes to what they stand for and to what of their people they’re supposed to represent. But a leader could also be considered to tug their people along with them – after all, a single person isn’t going to be able to cover all of their peoples’ desires and beliefs. So these multifarious ideologies and such get tugged along behind a single leader who, hopefully, embodies at least what everyone considers the most important things among their beliefs. Then there’s the equally mysterious “feorh-laestas,” or “step taken to preserve life, flight? [sic].” Yep, this is another one that even Clark Hall and Meritt of A Concise Anglo-Saxon Dictionary fame aren’t sure about. If we take it apart we quickly find that their tentative definition works fairly well. The word “feorh” means “life,” or “principle of life” and “laestas” means “leaving,” “step,” “trail,” or “footprint.” So there’s definitely some reference to something being left behind. Maybe, in the case of Grendel, the poet’s actually referring to the trail of blood that the monster is leaving as he drags himself back to the fen. Since Grendel’s mortally wounded, it’s not just any blood he’s leaking, but it’s his very life blood, the loss of which seals his doomed fate. Why do you think the combination of a word for “folk” and “tough” or “tugging” means “leader” in Anglo-Saxon? Does it suggest anything about what the Anglo-Saxons thought about people who lead? What about the combination of the word for “life blood” and “trail” meaning “step taken to preserve life” or “flight”? In the next entry Beowulf and the visiting chieftans go for a celebratory ride. This entry was posted in Beowulf, poetry, translation and tagged Anglo-Saxon, Beowulf, Grendel, Old English, speculation, words by NSCZach. Bookmark the permalink.